Let me start by saying, I’m no Comic Book guru. Far from it actually. Growing up, I hardly remember reading a single issue of anything outside of my Sonic comics. But being a child of ’87, it put me in the running to catch those early morning runs of Spider-Man and X-Men – and that alone helped me navigate the nerdiest of conversations in the schoolyard. Fast forward 20 years – and here I am, having read just as many comics as I had all those years ago. But that’s about to change. With a slight push from P1 of Cartridge Bros. fame, and fellow Comic pros like Fitgnat, I’ve downloaded the Marvel Unlimited Comic app, and I’m ready to chronicle my adventure of reading EVERY SINGLE ISSUE!! ….. k, probably not – but I’ll give it a good effort – and I hope you can join! For my inaugural read in the Marvel Unlimited Comic App, I decided to kick off with the Silver Age comics. 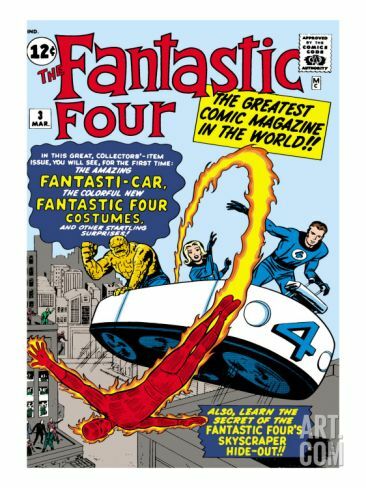 And what better starting point, than with the very first issue of The Fantastic Four!? Immediately I was taken aback by its cheesiness. 10 years of the Marvel Cinematic Universe had hardened me, it seemed. But reading on, it began to grow on me. Quickly. And without a struggle, I was able to flip swipe through the last page, wanting more. Lots more! This issue introduced us to each of the Fantastic Four. The leader and genius scientist Mr. Fantastic (Reed Richards), the brash but powerful Human Torch (Johnny Storm), his much more compassionate and level-headed sister Susan Storm (Invisible Woman) and the hulking yet grumbly titan Thing (Ben Grimm) – my personal favorite of the bunch I might add. After worldwide reports of atomic plants being destroyed by cave-ins, they must combine their powers to defeat Earth’s newest threat – The Mole Man! It was really great to see how this all began. Was also particularly awesome to see Mole Man. I remember him appearing in the early X-Men comics, but didn’t realize he made his appearance so early on. Those 3D glasses are something else! This issue also looks to be the official first appearance of The Thing, Mr. Fantastic, Human Torch, Invisible Girl – as well as Tricephalous, Giganto and Ugu the Neolithic. Excited to see more of them in the future! If you’re wanting to look back at some of the earlier Marvel comics, I’d definitely suggest starting with this one. Title: The Fantastic Four Meet the Skrulls from Outer Space! Riding the highs of Issue #1, I hopped right into the next one in the lineup. With Issue #2 of The Fantastic Four, the quirkiness continues. Moving away from the ‘monsters’ of the premier issue, we instead take a left-turn right into the realm of ‘aliens’. Not just any aliens though – the first appearance of the Skrulls! Readers are introduced to their dastardly plans to destroy the Fantastic Four and we get some insight into their morphing abilities. Looking at the art style – they immediately reminded me of Corvus Glaive’s design in the Infinity War movie – so I guess we’ll see if I’m on the right track. It’s the regular ‘good-guys’ vs. ‘bad-guys’ in this one, with the added element of the F4 being framed and locked up by the military. This includes Human Torch being quarantined in a room made of asbestos…definitely a 1960’s comic. And to top it off, this issue has one of the cruelest villain defeats in comic history! Definitely, give it a read and see for yourselves. Title: The Man in the Ant Hill! Next on the list (between issues #2 and #3 of Fantastic Four) was this entry of Tales to Astonish. Like with the other issues in the lineup, these comics are split up into multiple stories, but the real meat of this issue is a mini-story called, “The Man In The Ant Hill”. It marks the first appearance of Henry Pym and the prequel to what would eventually become…Ant-Man! Ridiculed and rejected, Issue #27 introduces us to (yet another) extraordinary genius of the Marvel universe who’s down on his luck. But after years of pursuit, he’s finally created a serum that can shrink objects down to a fraction of the size (this’d really come in handy for that ‘ol video game collection). But after shrinking himself down, he finds himself in a predicament, and he needs all the help he can get to return to normal. Being a fan of the Ant-Man appearances in the MCU, I couldn’t help but think of this as a young Michael Douglas. And while the story is a little bizarre (as with most of the Tales to Astonish comics), stick with it, and you’ll be rewarded with a pretty cool read. Kinda reminds me of watching Honey I Shrunk The Kids as a kid….good ‘ol “Antie”. With the first appearance of Ant-Man under my belt, I decided to jump back into The Fantastic Four with Issue 3. We’d seen The Mole Man, we’d seen the Skrulls – what else did this series have in store for me? Turns out – it was The Miracle Man. A stage magician turned criminal, this new dastardly foe had the ability to summon forth seemingly whatever he wanted. A terrifying monster, a raging thunderstorm, a hulking giant. But the more the Four fought, the more they realized that not everything was what it seemed. Immediately when being introduced to The Miracle Man, I thought of Mastermind from the early Uncanny X-Men comics; and so the twist towards the end was not quite the surprise that I think Stan was hoping for. And I still think Mastermind is a bit cooler. The issue is packed with more of the same monster antics from the first issue, although with a bit of a different flavour. And some especially strange moments like Mister Fantastic turning into a bouncy ball to dodge machine-gun fire. Overall, a good – not great – story, but I do admit, was pretty cool to see the F4 finally garner their trademark outfits, courtesy of Sue Storm. Amazing that these uniforms have stood through nearly 60 years of comic adventures. That about wraps up the first set of my reads. Would LOVE to hear what you guys think of these issues, or if you have any suggestions on other lineups I should read. Let’s chat about all that and more right here, or over in the Cartridge Club forums.